In 1996 Weezer recorded their sophomore album, Pinkerton. While it failed to become an immediate hit, it was a cult classic with fans (going gold in 2001). In 1997, distressed by the public's reaction to Pinkerton, the band took time off to regroup and plan its next move, during which time Sharp left the group. While Rolling Stone named Pinkerton the Worst Album of 1996, they later re-reviewed it and awarded it 5 stars, adding it to the Rolling Stone Hall of Fame in 2004. With the producer of their debut, Ric Ocasek, again at the helm, Weezer next recorded 2001’s Weezer (aka “The Green Album”), which debuted at #4 and has since sold more than one million copies in the United States. Songs like "Hash Pipe" and "Island in the Sun" became radio and MTV staples. During their tour that summer’s tour, Shriner joined the band. The band followed that success with Maladroit, which was released in 2002, reached #3 on the Billboard 200, and was certified gold. Two years later, Video Capture Device DVD featured home video footage, music videos, commercials, rehearsals, concert performances, television performances, and band commentary, and was certified "gold" following its 2004 release. Weezer returned to the studio again to work with Rick Rubin on their fifth full-length album. Make Believe appeared in May 2005 and eventually went platinum in multiple countries. The album gave Weezer their biggest charting album peak yet, hitting #1 in Canada and #2 in the U.S. Make Believe featured the band's first two songs to top the Billboard Modern Rock Tracks chart, "Perfect Situation" and Top 10 single “Beverly Hills,” which earned the band their first Grammy nomination for Best Rock Song. 2008’s Weezer, (aka “The Red Album”) followed which featured a more collaborative approach toward songwriting and shared lead vocals on tracks. Lead single "Pork and Beans" topped the Billboard Modern Rock Tracks charts for 11 weeks, and its music video won a Grammy for Best Short Form Music Video. The Red Album debuted at #4 on the Billboard 200 upon its release. One year later, the band returned with Raditude, which debuted as the seventh best-selling album of the week on the Billboard 200 chart. It found the band collaborating with hip-hop producer Jermaine Dupri, rapper Lil Wayne and members of The All-American Rejects. 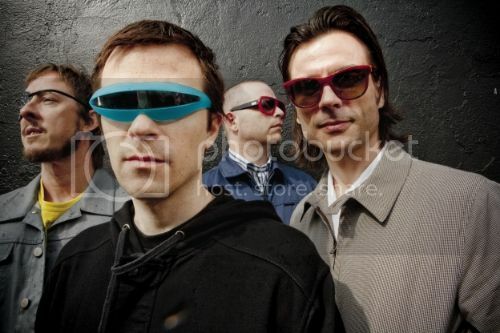 Weezer jumped from Geffen to independent label Epitaph in 2010, debuting Hurley at #6 on the Billboard 200 to make it the band’s sixth top 10 album, as well as their sixth top 10 album in a row. The new album was quickly followed by two additional releases: an expanded deluxe edition of Pinkerton and Death to False Metal. The band then took to the road to play Pinkerton & their eponymous debut “Blue Album” in their entirety, in full a tour titled “The Memories Tour,” dubbed “Blinkerton” by fans. In January 2012, Weezer launched the first ever Weezer Cruise. They were joined by 16 other bands including Dinosaur Jr, Sebadoh, Wavves, The Antlers, Yuck, and many more. A music-festival-at- sea, Weezer played shows on board and engaged in on-board activities with cruise goers. Following the cruise, the band hit the festival circuit and toured Australia for the first time in 16 years. Starting in Jakarta, Indonesia and a show Auckland, New Zealand, the band traveled to Australia to perform Blue Album Memories Shows.